Burn iTunes movie to DVD/ISO/DVD Folder/Blu-ray DVD Easily. Edit iTunes videos before iTunes to DVD conversion. Customize DVD template for iTunes to DVD conversion. Purchased several movies from iTunes and now want to watch them on your home DVD player or TV? The best way to do so is to burn DVD from iTunes using good DVD burning software. Before you burn your iTunes video to DVD, make sure that movie, TV show or video is not DRM protected. There are a number of iTunes videos which are protected by FairPlay DRM technology and thus can only be played on Apple devices and cannot be burned for backup or playback. So in the following part of the article, we will discuss on how to burn iTunes movies to DVD which are not DRM protected. 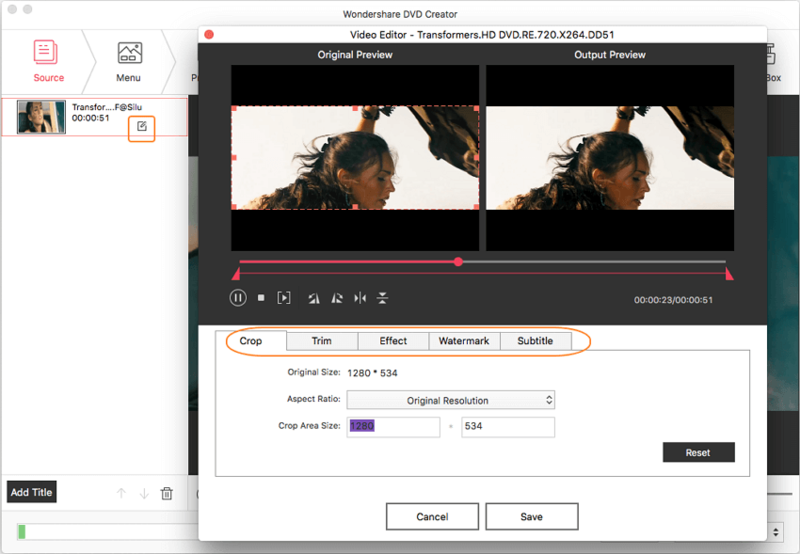 To burn iTunes movie to DVD on your Mac system, we recommend Wondershare DVD Creator for Mac. This excellent iTunes video to DVD converter allows burning your DRM-free movies, TV shows, and other iTunes downloaded videos in high-quality DVD disc. If needed, the files can also be burned in Blu-ray disc, DVD folder or ISO image files. Support for all popular video, picture, and audio formats gives you the freedom to create a slideshow with a combination of your media files. Make your disc look professional with free static and dynamic DVD templates which can also be customized. Adjust the contrast or brightness of the videos, rotate it, trim unwanted parts and make other changes using the built-in editor. The software is also compatible with Window system, allows creating new chapters and supports real-time preview option as well. 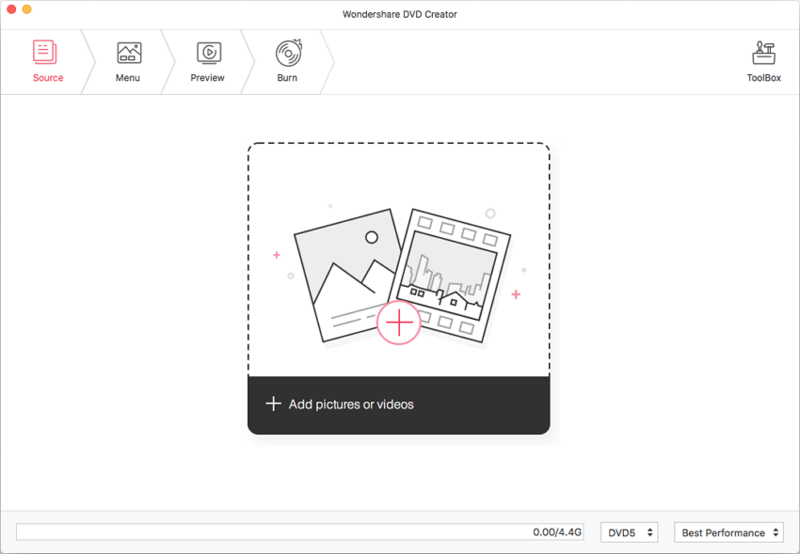 · Create photo slideshow with music and transition effects to DVD easily, and other additional functions such as Video Edit, One-click burn, DVD to DVD, DVD to Video, etc. · Customize DVD menu by changing background image or music, adding text, creating chapters, adjusting aspect ratio, and others. 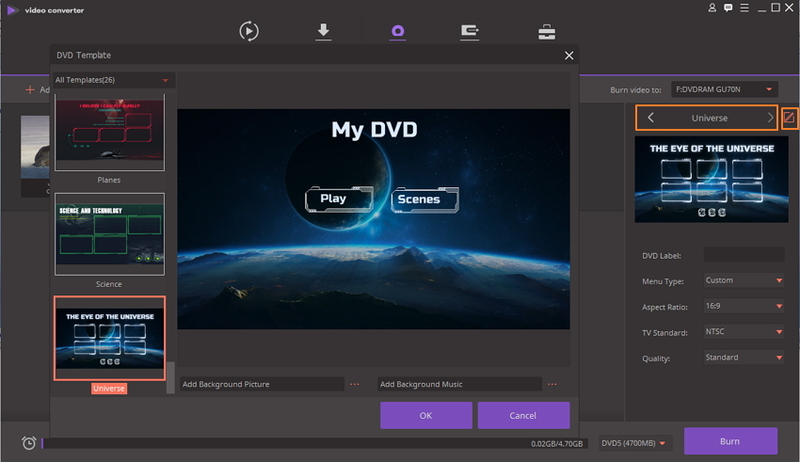 · Offer 100+ free static and dynamic menu templates from Nature, Family life to Movie theme to make your DVD menu attractive. · Built-in editor to personalize videos by trimming, rotating, cropping, adding watermarks, applying effects, etc. · Burn DVD from iTunes with super fast burning speed and high quality output. Step 1 Run iTunes movie to DVD and choose for a new project. 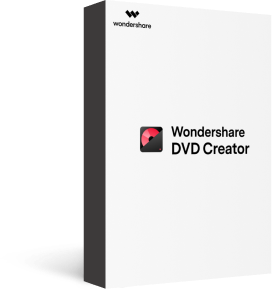 Launch Wondershare DVD Creator software on your Mac system. From the window that appears, select the Create a New Project option. Step 2 Add and edit iTunes video. Click the + sign in the center of the interface to browse and add DRM-free downloaded iTunes videos on your Mac. You can also drag and drop the files you wanted to the program. For editing, select the desired video and click the pencil-like icon on its thumbnail. 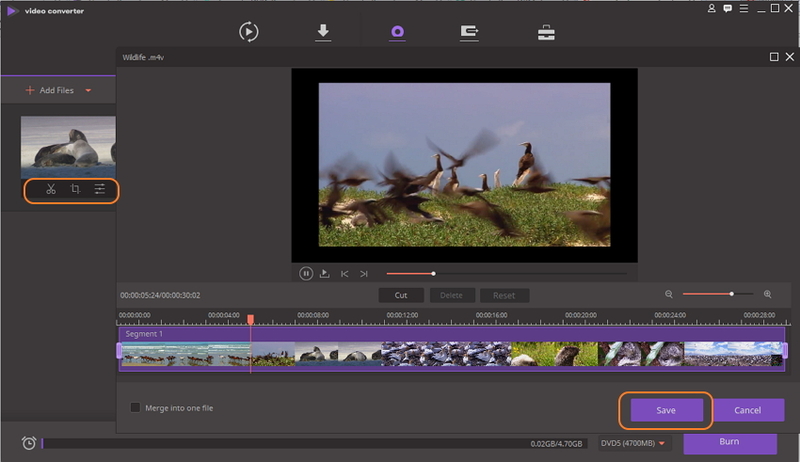 A new pop-up window for Video Editor will appear. Make the desired changes to the video such as Crop, Trim, Rotate, Watermark, Effect, etc. and click OK button to confirm. Step 3 Select DVD template theme from iTunes video to DVD converter. Click the Menu button to open the DVD menu template design list, where you can choose from almost 100 creative DVD menu template for your creation. For customizing the template, click the icons to edit thumbnail, change background image and music, or make other adjustments as needed. Step 4 Preview and convert iTunes movie to DVD. To preview the created DVD, click the Preview tab. If you feel any changes are needed, you can still do them as needed. Once all settings are done, move to the Burn tab. 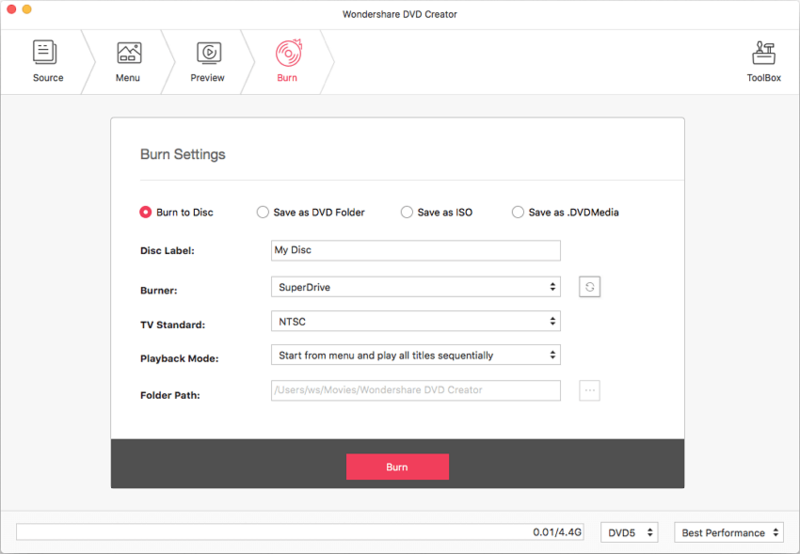 Choose Burn to Disc option and give the Disc Label, Burner, TV Standard and other settings. Finally, click Burn button and the burning process will start. Want to burn your iTunes movies to DVD on Windows system? Wondershare Video Converter Ultimate is the best tool for it. 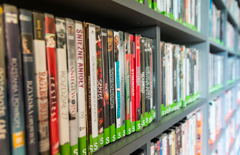 The software works as a complete video-toolbox and supports converting your iTunes downloaded movies to DVD disc, Blu-ray disc, and DVD folder. If you want to burn your files to a disc later, you can also burn them to ISO image files using the program. There are a number of DVD menu templates available to ensure that you have professional looking discs in high quality. You can also add background music or image to further enhance its appeal. In addition to DVD burning Video Converter Ultimate supports hosts of other features including video conversion, download, transfer, and others. Step 1 Open iTunes video to DVD burner and add import videos. 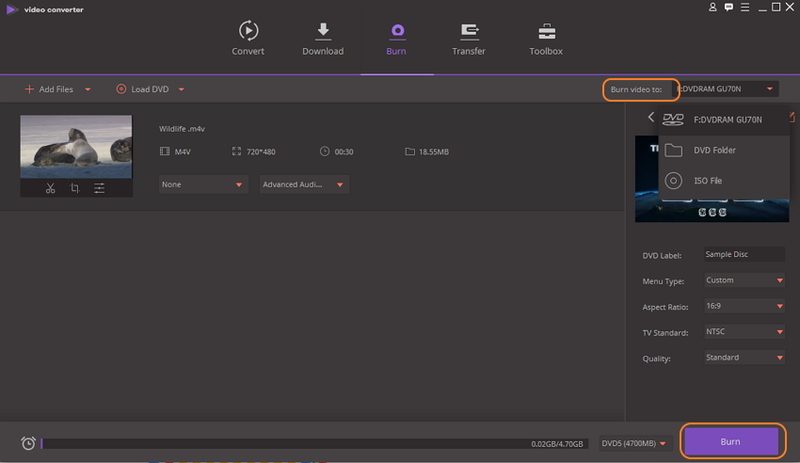 Download, install and launch Wondershare Video Converter Ultimate on your Windows PC. From the main interface select the Burn tab. 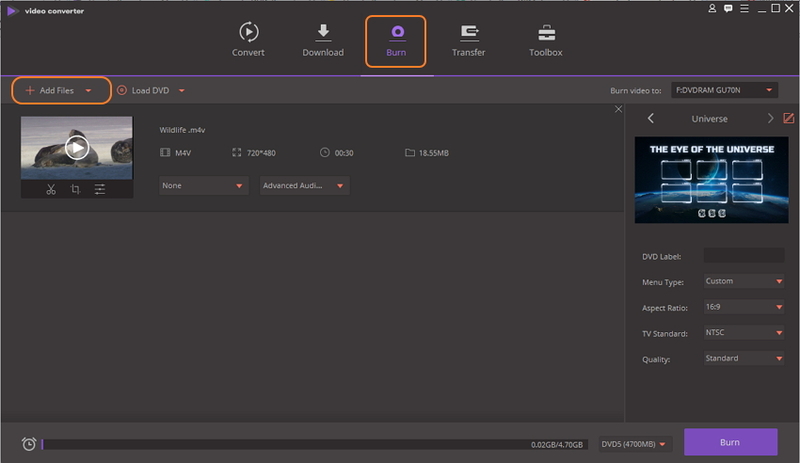 To import the DRM-free videos on your PC, click +Import files. For quick adding you can also drag and drop the files. Step 2 Edit iTunes video. To edit the videos before burning, click the editing icons on the thumbnail. A new window for editing functions will open. Make the changes and click Save to confirm them. Step 3 Choose DVD template. Next, choose from the available DVD menu themes on the right side of the screen. Moving right and left arrows will enable you to check the designs. To add background image or music and see more designs, click the edit icon on the left corner. Step 4 Select parameters and label. Give a name to your DVD on DVD Label section. Choose Manu type, Aspect ratio, TV Standard, and Quality. Step 5 Burn iTunes movie to DVD. Finally, select location where you wish to burn your iTunes file at Burn Video to: tab at the top-right corner. Click the Burn button on the bottom-right corner to start burning videos to a disc. The above steps will help to burn TV shows from iTunes to DVD and other videos as well. To help you convert iTunes movie to DVD Mac or Windows, listed below are some useful tips. 1. Is there a workaround to remove DRM from iTunes Movies? There are a number of tools available that allows removing the DRM protection for your iTunes movies. Using these programs you can rip off the DRM protection by converting videos to another format. Once the DRM is removed, the TV shows or videos are ready to be used by DVD burning tools. 2. What factors should be considered while selecting iTunes to DVD Converter? There are a number of programs available to burn iTunes movie to DVD. Though selecting software totally depends on your requirements, there are a few factors which must be considered for quality DVD burning. The software must have DVD template themes to choose from. A good template design matching the video theme will make your DVD look professional. Option to create new chapters will definitely help you in the proper navigation of disc content. Video editing, template customization, and fast burning speed are some more features to look for. 3. How to make a professional disc from iTunes videos? 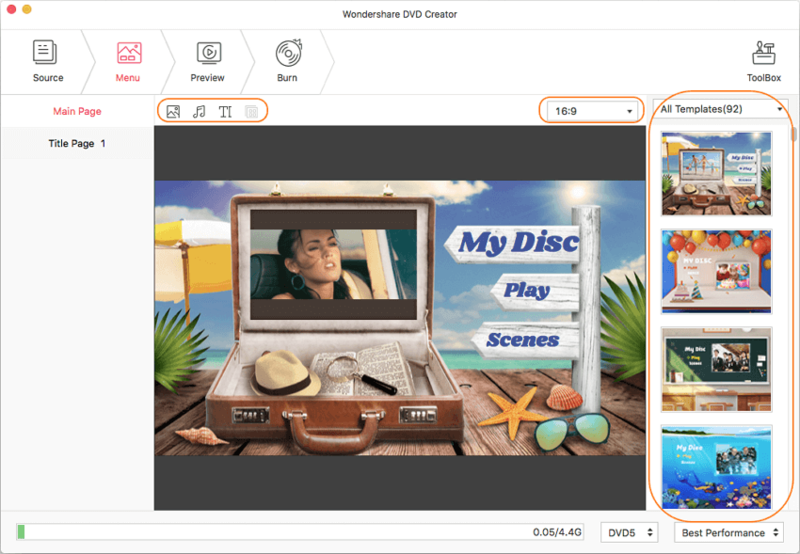 To create a professional looking disc from your downloaded iTunes video, you need expert software like Wondershare DVD Creator that supports a host of DVD burning features and options. The professional software let you choose from available templates so that there is a matching theme. Add a background image or music to give adds an appeal. You can also customize the font size and color or the buttons; edit thumbnails and frames to add creativity. Option to create chapters help in easy navigation of the video content. 4. Is there free iTunes to DVD Converter available? In addition to paid professional software, there are a number of free tools available as well that allows burning your iTunes videos to DVD disc. In comparison to professional software, free tools are very basic in nature and do not support advanced features. 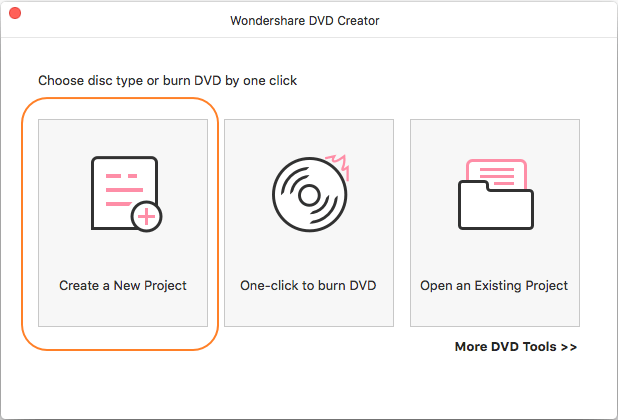 So if you want your iTunes videos to burn in good quality with all high-end features, go for an expert solution like Wondershare DVD Creator.